Respiratory diseases lead to significant amounts of disability and death each year in the United States. Chronic lower respiratory diseases, pneumonia, and influenza are all in the top ten leading causes of death in the U.S. Other than smoking, one might think that diet and lifestyle has little to do with these conditions, but that's not necessarily true. The key to breathing easier lies in avoiding or stopping smoking and adopting a whole foods, plant-based diet. Increased physical activity will also bolster lung function and capacity. 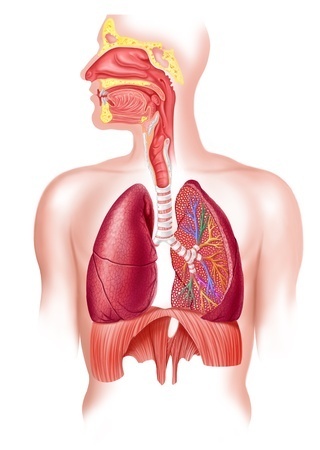 For more information on respiratory health see the articles below. 1 Pandey KB, Rizvi SI. Plant polyphenols as dietary antioxidants in human health and disease. Oxidative Medicine and Cellular Longevity. 2009;2(5):270-278. 2 Keranis E, Makris D, Rodopoulou P, et al. Impact of dietary shift to higher-antioxidant foods in COPD: a randomised trial. Eur Respir J. 2010 Oct;36(4):774-80. 3 Romieu I. Nutrition and lung health. Int J Tuberc Lung Dis. 2005 Apr;9(4):362-74. Review. 4 Alperovich M, Neuman MI, Willett WC, Curhan GC. Fatty acid intake and the risk of community-acquired pneumonia in U.S. women. Nutrition. 2007 Mar;23(3):196-202. 5 Varraso R, Fung TT, Barr RG, et al. Prospective study of dietary patterns and chronic obstructive pulmonary disease among US women. Am J Clin Nutr. 2007 Aug;86(2):488-95.